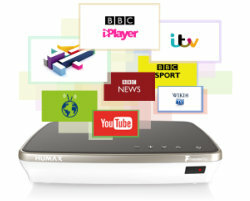 In a nutshell: The Humax FVP-4000T is a Freeview Play box with three HD tuners, and access to catch-up TV from the BBC iPlayer, ITV Player, and All 4, with Demand 5 coming soon. It benefits from built-in Wi-Fi, but it's odd coffee-coloured design won't make it everyone's favourite. The Humax FVP-4000T is the first TV box with Freeview Play - an alternative to the popular YouView system, incorporating broadcast TV and catch-up TV services via a single easy-to-use programme guide. Like YouView, Freeview Play lets you scroll forward or backward 7 days to access content on the most popular channels using the BBC iPlayer, ITV Player, and All 4 players, with Demand 5 coming soon. The Freeview channels now include more than 60 subscription-free TV and 25 radio stations. Of these, 12 TV channels are HD. You'll need to connect the box to a TV aerial to access Freeview, and to the internet to access catch-up TV. Usefully, the FVP-4000T includes built-in Wi-Fi, as well as ethernet (cable included), which gives it a distinct advantage over all current YouView boxes, none of which include Wi-Fi. 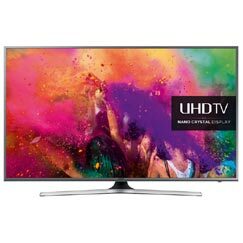 A HDMI cable is needed to connect your box to your HD TV. 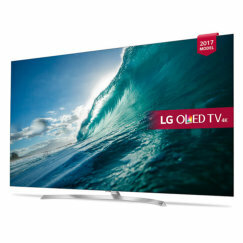 Other connections include a digital optical output for connecting to a home cinema system, and a USB port. The box integrates with your home network via Wi-Fi or ethernet, so you can watch content from your PC, phone, tablet or USB device on your TV screen. 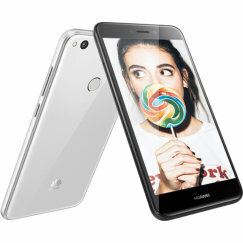 We really do need to say something about the design and looks of the Humax FVP-4000T. It's not your average TV box. 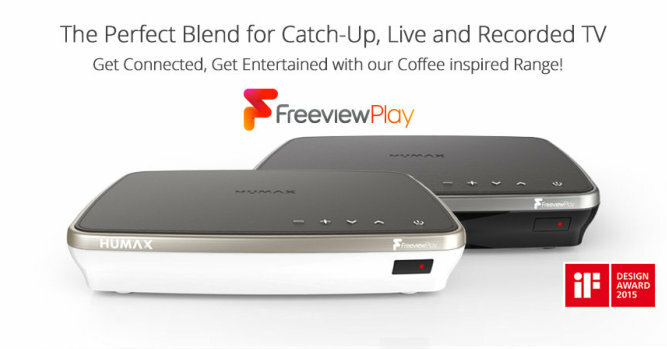 According to Humax, it's coffee-inspired, and comes in a choice of Mocha or Cappuccino. Cool. Except that it will stick out like a cup of spilled coffee amongst your black or silver AV equipment. Do we want to notice our tech equipment while we're watching Eastenders? Not really. In fact, no. The remote supplied with the box has a striking two-tone design. It's an improvement over many Humax remotes, but there's still too much going on with the design, and it isn't always easy to place your finger on the right button when fumbling for it late at night. As well as watching live and catch-up TV, the Humax is a fully-featured PVR (personal video recorder), so you can pause and rewind live TV and also record programmes on the hard disk. In fact, it's better equipped than any other recorder in this respect. It has 3 tuners, which magically enable you to record 4 programmes simultaneously whilst watching a 5th. Good luck to you if you can find that many channels worth recording. The PVR has plenty of features, including series link, and the ability to alter the start and end times to avoid programmes getting clipped if they run at the wrong time. The hard drive has a capacity of 500GB, which is enough to record 300 hours of standard definition content and 125 hours of HD. 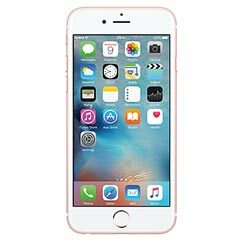 A 1TB version is also available, offering double the recording time. A free Humax app lets you use your smartphone or tablet to view what's on TV now and over the next 7 days, and set your box to record. There isn't much to choose between YouView and Freeview Play, so this box is a direct competitor to YouView boxes like the Humax DTR-T2000. The Humax FVP-4000T has the advantage of including built-in Wi-Fi, but the design makes it an oddball and it won't appeal to everyone. Will my Humax FVP 4000T allow me to watch The Grand Tour from Amazon? Does this product have a 2 year warranty? How can I access Amazon Prime Video using my FVP 4000T? 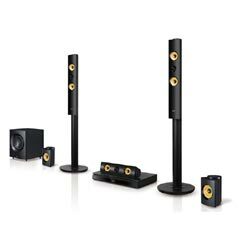 I've just subscribed to Amazon Prime and am hoping that there is some way to connect directly to the Humax FVP 4000T. If not, is it possible to download Amazon Prime Video to an iPad and then connect the iPad to the FVP 4000T so that I can watch the video on large-screen TV? I bought this on impulse when my existing Freeview recorder started getting wobbly, it needed a cooling fan but has been retired. The Humax looked nice on the shelf display at Currys, not a boring black box but as it wasn't connected I was unable to try it out. The menu is big and easy to read but painfully slow to respond, turning the unit on is hit and miss since the power/status LED is UNDERNEATH the box, what a stupid place for it to be especially as it takes almost 30 seconds to wake up. It often starts up only to acknowledge the button press again by turning off so you can wait around again. If you are watching a recording that is in progress look forward to a black screen where nothing happens when the program has finished recording. Eventually the unit will wake up again but by then I'm fed up waiting, it may boast three tuners but when I'm only using one and using it to catch up on a live broadcast this is not acceptable. This is a great unit if you want to tidy the kitchen, mow the grass or simply give up and go to the pub but for watching Freeview content this is a bit of an ornament. TLDR; This will annoy you, buy something else. Not as good as our old Humix freeview recorder which allowed you to bookmark within a programme. Also slow to upload info of a programme and then you have to exit screen and move to next programme before accessing the info, In the old model,you were able to access the next prog info directly from the current prog info. Also when accessing the recorded programmes, the list of titles include an image which may or may not reflect the recorded programme as it is of the starting image so often it is from either the previous programme or an advert- not very useful as it takes up screen space so you don't see many recordings on the screen and have to scroll down more.